FILE - U.S. Treasury Secretary Steven Mnuchin is seen during a ceremony at the Treasury Department in Washington, Nov. 27, 2017. The Trump administration has imposed new sanctions on three Iranian organizations and six Iranians whom it says have committed serious human rights abuses on behalf of Tehran. The three organizations sanctioned by the U.S. Treasury Department in a Wednesday statement include Iran's pro-government vigilante group Ansar-e Hizballah, Tehran's Evin prison, and government-backed mobile app developer Hanista Programming Group. The department's Office of Foreign Assets Control also sanctioned three leaders of Ansar-e Hizballah, two government officials whom it said are involved in state censorship activities, and the director of Iranian state broadcaster IRIB. The U.S. statement quoted Treasury Secretary Steven Mnuchin as saying Iran's government "diverts" national resources that he said belong to the Iranian people and uses those resources to "suppress" free speech and fund a "massive and expensive censorship apparatus." "Those who speak out against the regime's mismanagement and corruption are subject to abuse and mistreatment in Iran's prisons," Mnuchin said. "America stands with the people of Iran, and Treasury is taking action to hold the Iranian regime accountable for ongoing human rights abuses, censorship, and other despicable acts it commits against its own citizens." The sanctions put a freeze on all assets of the designated organizations and individuals in U.S. possession and "generally prohibit" Americans from engaging in transactions with them. Foreign financial institutions or individuals who "knowingly" provide material support to those designated also risk exposure to secondary U.S. sanctions that could cut them off from the U.S. financial system. 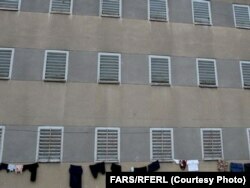 FILE - An undated photo shows the exterior of Evin Prison in Tehran, Iran. Evin Prison is among the entities sanctioned under the latest U.S. punitive measures against Iran. In a May 21st speech, U.S. Secretary of State Mike Pompeo said the Trump administration plans to impose what he called the "strongest sanctions in history" on Iran unless it accepts 12 U.S. demands to stop activities that he said are aimed at developing nuclear weapons and pursuing regional hegemony. Iran denies seeking nuclear weapons. Supreme Leader Ayatollah Ali Khamenei ridiculed the U.S. warning two days later in remarks to a gathering of officials, saying: "The U.S. has tried various political, economic, military and propaganda undertakings to hit the Islamic Republic, [but] all these plots failed. Like the famous cat in Tom and Jerry they will lose again." Khamenei was referencing an American cartoon series in which a wily mouse named Jerry consistently outsmarts a cat named Tom. The Treasury Department said Wednesday it sanctioned Ansar-e Hizballah for collaborating with Basij militiamen to violently attack Iranian students with knives, tear gas and electric batons. It said the group also is linked to acid attacks against women accused of flouting strict Islamic dress rules in Isfahan city. The statement said the U.S. sanctioned Evin prison because the facility subjects political prisoners and other inmates to "brutal tactics" by authorities, including sexual and physical assaults and electric shock. Iran's Hanista Programming Group also was targeted for developing two social media applications called Mobogram and MoboPlus. The Treasury Department said Hanista embedded malicious content in the apps to facilitate the monitoring and tracking of Iranian citizens – a functionality that it said could enable the government to commit serious human rights abuses. Tehran has tasked Hanista with distributing domestic apps as alternatives to the popular foreign-made Telegram messaging app, which the government banned Iranians from using earlier this month. The U.S. statement said the two sanctioned government officials and IRIB director Abdulali Ali-Asgari all have engaged in efforts to censor free speech and media in Iran.